Here is an interesting Las Vegas Real Photo casino view! 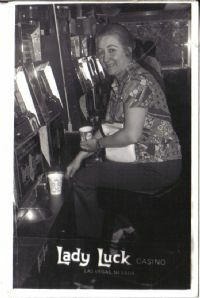 It pictures a woman sitting at the slots with a cup of coins. Clearly in view is the old metal slot machine. Her seat reads "Lady Luck Casino Las Vegas Nevada". Back is divided and is postally unused with a "Kodak Place Stamp Here" stamp box. Condition is very good as shown! Here is another nice old 50's Las Vegas image! These old chromes are super! This one pictures the Nevada Club in Vagas, complete with 1950's autos out front. A marquee lists the coming attractions while a huge searchlight sits on the sidewalk. Back is divided and unused. Condition is mint! "The Postcard Guy" is a Registered Trademark filed with The US Patent and Trademark Office" and is the property of the registrant, Kevin Hughes.